Hima Das must have won international track gold for India but closer home a curious section on social media was busy wondering something else — What is Hima Das' caste? Hima Das became the first Indian athlete to win an international gold for the country. The 18-year-old from Assam won track gold in the 400 metre final in Finland, at Tampere’s World U20 Championships. Yet, a curious section on social media was busy wondering something else — What is Hima Das’ caste? The Google search on Hima Das, particularly her caste, saw a spike after she won the gold. This is not the first time that a champion is being seen from the prism of caste. Earlier, when badminton champion PV Sindhu won silver at the Rio Olympics, the Google search on her caste went up, especially from Andhra Pradesh and Telangana region. And now, Google Trends showed how caste was the most searched “related topic” pertaining to Das, with the search highest from Assam, followed by Arunachal Pradesh, at the time of writing. 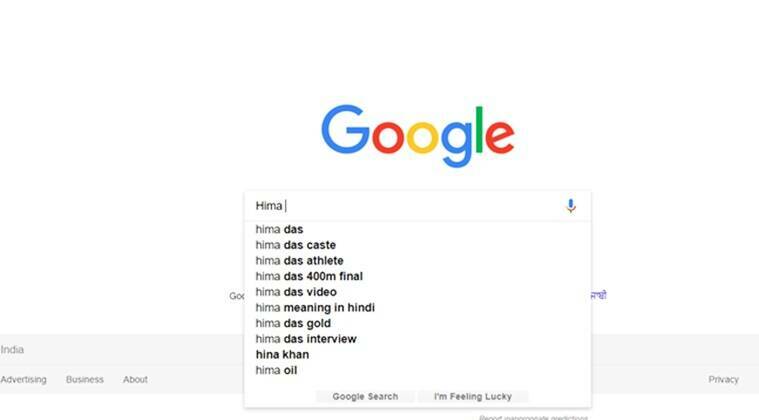 Additionally, one just had to type Hima to get the immediate search result as “Hima Das caste”. Of course, as many were busy trying to get a hold of what ‘caste category’ Das belonged to, the searches resulted in a buzz on the Internet. today feels like I’m in a time-machine and sent to the future. The google search for Hima Das is a lot LESS surprising than people expressing surprise/ shock for that act. .we still live in India, 2018 no? or is it post-caste already? Funny how as the video of tears rolling down Das’ cheeks as the National Anthem played at the podium gave us goosebumps, many thought doing a quick search of Das’ caste was more important than her prestigious achievement. No?